Servers | IGS | Intimidation leads to frustration? We all know how difficult it is to face a stronger opponent. More so, when he is several stones stronger than us. leading him to get frustrated, while the game was still manageable. For starters, I think black's first move is not what I would play. 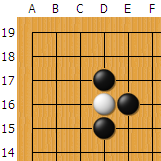 K16 or any of the simple keimas in the 3 "free corners"
you should play the ogeima, but it is a more difficult move than the simple keima. The variations I want to point out are on the sgf with some of my thoughts as well. Variation moves: 69, 97, 107, 111, 113, 145 and 147. I think generally that when the 2d player lost the left side felt quite frustrated because he played super safe with the C10 move. anybody reading this article. These are just simple thoughts of mine. If you have any extra thoughts, pointers or corrections please tell me. I am still learning myself after all :-). I think playing the keimas in a 6 handi game is cowardly. You have influence? Use it!